It’s time once again to loop back and look at the results of our two most recent surveys. These aren’t in the slightest bit statistically significant but do provide a glimpse into the minds of our most engaged readers. Let us know in the comments if you enjoy these quick surveys, or if you have thoughts about why the results turned out the way they did. 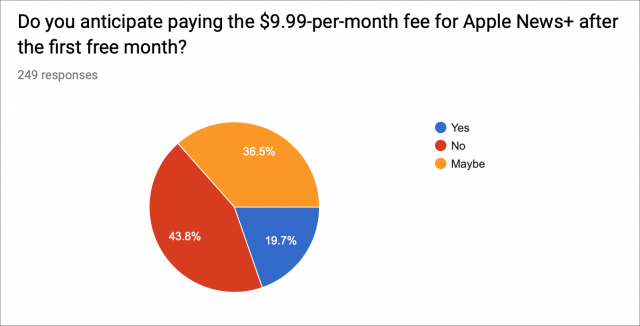 Alas, the hope I expressed in “Four Ways Apple Could Improve Apple Music” (11 March 2019) that Apple would announce enhancements to Apple Music during the “It’s show time” special event on 25 March 2019 was not fulfilled. But we also took the opportunity in that article to query TidBITS readers about which streaming music service they preferred. 254 people voted. 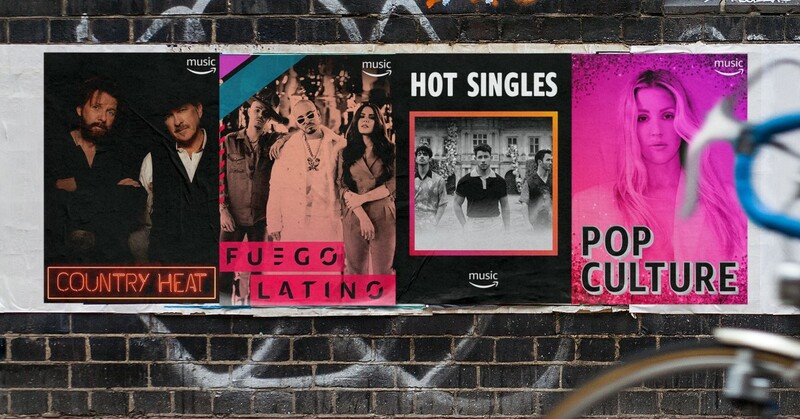 Spotify has a number of fans and racked up 12% of the vote. In the noise were Amazon Music Unlimited and Tidal (5 votes or 2% each), Pandora (4 votes for 1%), and Google Play Music (2 votes for less than 1%). Slacker Radio and YouTube Music, which I threw in for completeness, didn’t manage to attract a single vote. 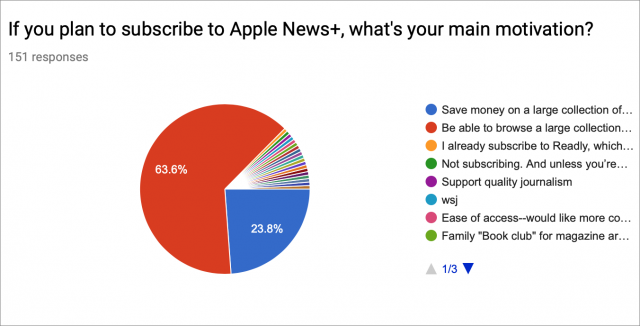 In “Apple News+ Debuts With Magazines, Newspapers, and Web Sites” (25 March 2019), Julio Ojeda-Zapata covered Apple’s recent unveiling of Apple News+, the $9.99-per-month magazine subscription service. At the end of the article, we asked a few questions to determine how Apple News+ might fit into our readers’ magazine consumption habits, attracting votes from 250 people. To start, we asked how much readers spend annually on print periodicals, with four choices: $0, under $50, between $50 and $120, and more than $120. 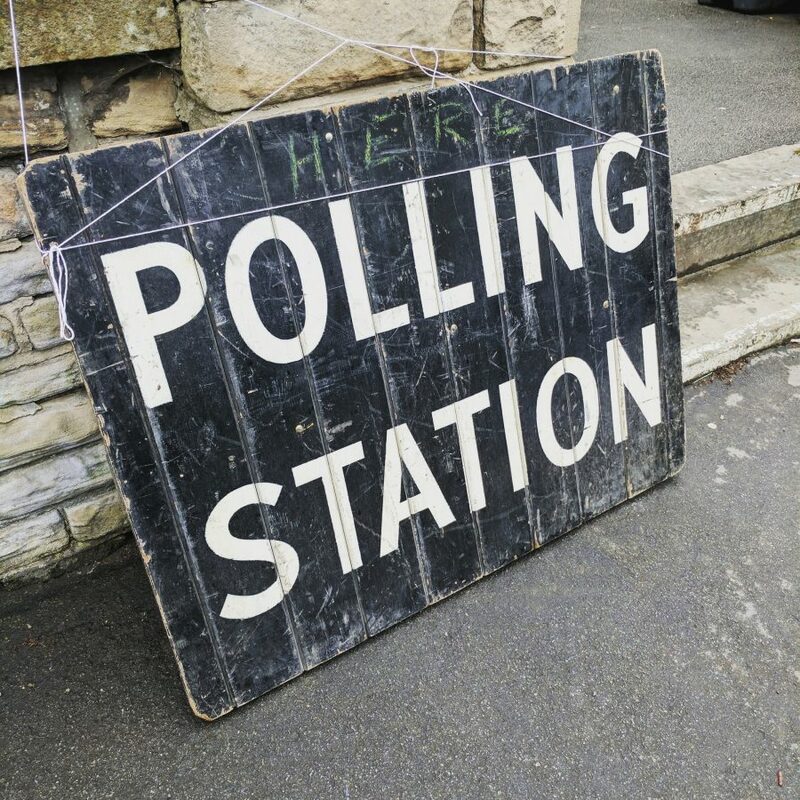 Rather surprisingly, the results revealed an almost even split, with roughly a quarter of respondents picking each choice. 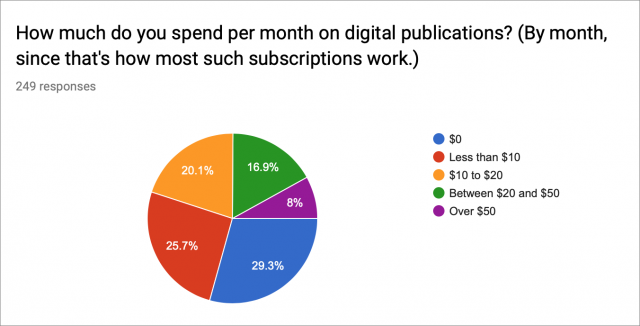 On the digital side of things, where subscriptions are usually billed monthly, we provided five options: $0, less than $10 per month, between $10 and $20, between $20 and $50, and more than $50. Interestingly, if we were to combine the top two options, the results would once again show a nearly even four-way split. When it came to the core question asking people if they anticipated paying for Apple News+ after the free trial ended, about 20% of respondents said they did, whereas 44% were certain they wouldn’t subscribe, leaving a significant 37% on the fence.